Disney World is operating a 'No Irish Welcome' policy. Or so it seems. Okay, it's not that serious, but it was brought to my attention last week that Disney's web site has omitted Ireland. Yup, that's right. When you use Disney's web site to buy tickets to visit Disney World in Florida you're asked what country you are from and, well, Ireland's not on the list. Canada is there. The United Kingdom is there. Germany is there. Israel is there. Guatemala is there. Iceland is there. Kuwait is there. And so on. 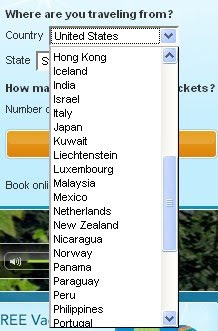 Just about any country you could imagine is on the list, but not Ireland. To be absolutely certain I checked for Rep. of Ireland, as it's known on many European web sites, and I even checked for Eire, which I've seen on a couple of sites. But Ireland is nowhere. I could get all emotional about it and wail about the insult to the Irish nation by virtue of this omission. Or I could speak of my deep sadness that a company founded by a man who was proud of his Irish roots could deny his ancestral homeland it's right to nationhood. I don't know how many people go from here to Disney World each year, but it's not an insignificant number. I'd be pretty confident that more Irish people go to Disney World than do Icelandic or Kuwaiti people. In fact, I suspect that Ireland sends a disproportionate number to Disney in Florida when compared with other EU states and, I'd bet, more than quite a few countries on the list. That's why I'm curious. 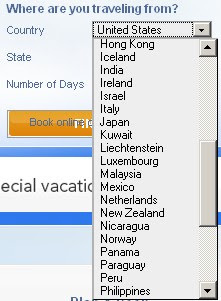 How did Ireland get left off the list since, from my own experience in web site development, these lists are pretty standard? And how is it nobody at Disney has noticed or been notified of this because I'm sure many people in Ireland must have come across this already. It's really only a minor issue, but still it's one that I bet Walt Disney would not be happy to learn of. Walt's grandparents - Kepple Disney and Mary Richardson were both Irish immigrants. The name Disney was originally d'Isigny, which is a Norman name, and his family at some point found its way to the area around Counties Carlow and Kilkenny, from where Kepple left Ireland. Walt visited Ireland many times and his affection for Ireland was what drove him to make "Darby O'Gill and the Little People," which Irish Times columnist Fintan O'Toole says is much misunderstood in Ireland. Disney's nephew Roy, who twice ran the Disney Corporation, also loved Ireland. Roy used to come to Ireland regularly and bought Coolmain Castle in County Cork in the early 1980's. Maybe I've misunderstood the Disney web site and this is a tribute to the Disneys' Irish ancestry. Irish people probably don't need to buy tickets to Disney World because it's free for everyone coming from Ireland. If that's it, then great. I'd like my free family passes please. UPDATE Jan 25: Disney's web site has been corrected to include Ireland. Again, I was pretty sure it was only an oversight, but I was curious as to how such a thing could happen and go unnoticed because so many people from Ireland go to Orlando. Thank you to PatrickLee whose comment below "brought to my attention" the fact that the web site had been fixed.